A Great Birthday Party Idea: A Waterslide Birthday Party! We got the idea for a waterslide birthday party when we visited a friend who had one of these cool giant inflatable waterslides in their backyard. Our kids had a blast playing on it and begged for one for our house. 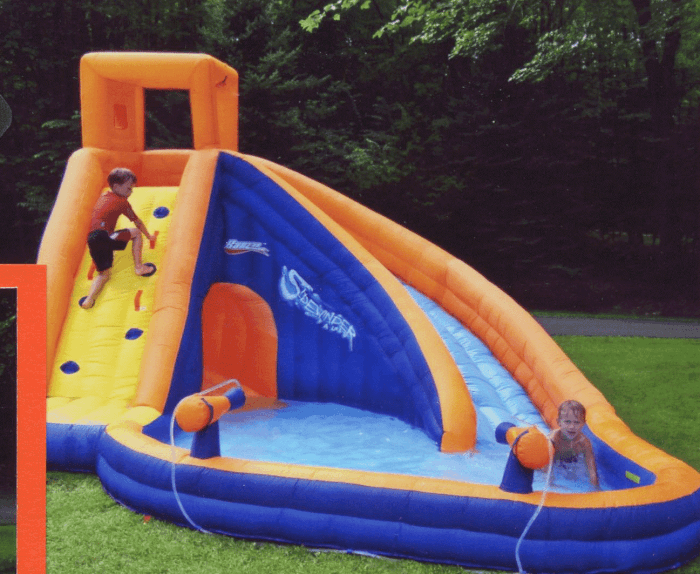 Since two of our children have August birthdays two days apart, we made a deal with them- if they wanted to receive the waterslide as a shared birthday gift, and if we hosted two kids birthday parties using the slide, we could “justify” the expense of the slide! Here's how we hosted our waterslide birthday party! While we celebrated both kids' parties on the same day, they were held at different times- the first party ran from 11 am-12:30 pm and the second party from 2-3:30 pm. It was great because they each had their own individual party with their own friends, and it was also easier on Steve and I because we just had one big setup and one big cleanup for the whole day. 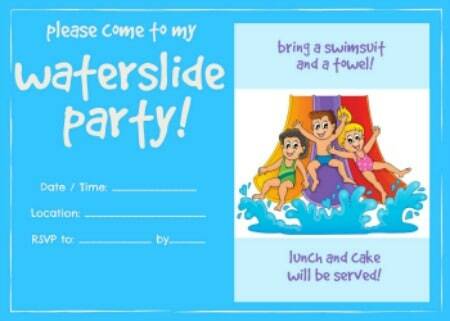 I created these Waterslide party invitations which can be printed and mailed or sent out as an email attachment. You'll find a download link to a blank invite you can use (for free!) at the end of this post, along with a printable thank you note and favor tag! First- You've Got to Get a Waterslide! Obviously- the first thing we did was to purchase the waterslide! The one you see pictured in this post is the Banzai Sidewinder Falls slide which has two slides (a large one and a small one), and a play area which was perfect when you had lots of kids splashing around while waiting for their turn to use the slide! Pricey? Indeed. As I mentioned, it was a shared birthday gift between two kids, it also served as entertainment for two birthday parties, and both sets of grandparents went in on with us! 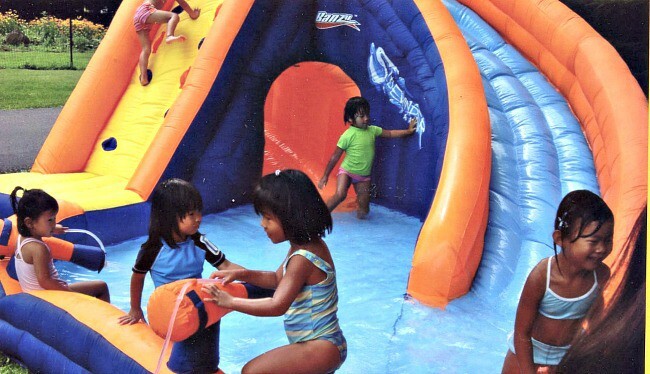 You can also find some less expensive options like this one– but be sure that they come with a blower to inflate the slide (and the blower runs constantly when the slide is in use to keep it inflated). You can also compare rental prices to just rent a waterslide for the day with a local party company- but in our case, it made more sense to buy one which I knew we would use over and over again! We also set up some outdoor games like this kids croquet set and this kids badminton set to entertain kids who wanted a break from the waterslide. Lunch consisted of homemade fish-shaped pizzas! I used this mini pizza recipe and shaped the dough into a circle with an attached fishtail! I pre-baked the crusts earlier in the morning, added the toppings, and one of the grandparents popped them in the oven about 20 minutes before lunch! 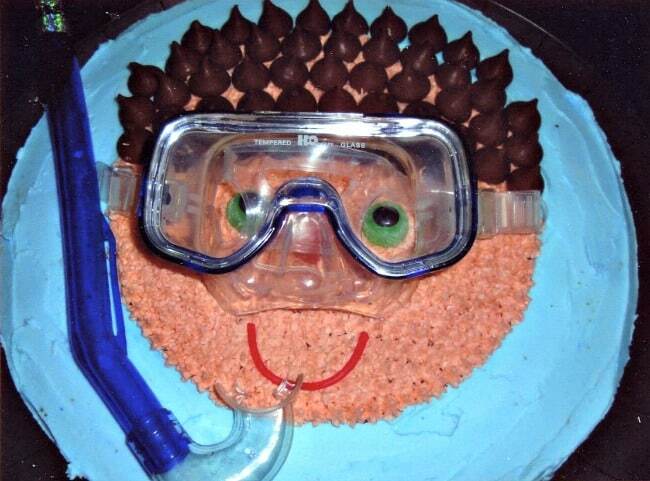 The birthday cakes were a snorkel girl and snorkel boy! I just baked the kids favorite cake flavor in both a small and large round pan. For the large cake, I spread turquoise-colored frosting over the entire cake, and then piped small stars in a peach-colored icing on the smaller round cake, adding a red licorice rope for the smile, a red gumdrop for the nose, two green or black gumdrops for the eyes along with a black M&M for the pupils. Unwrapped Hershey kisses served as hair. 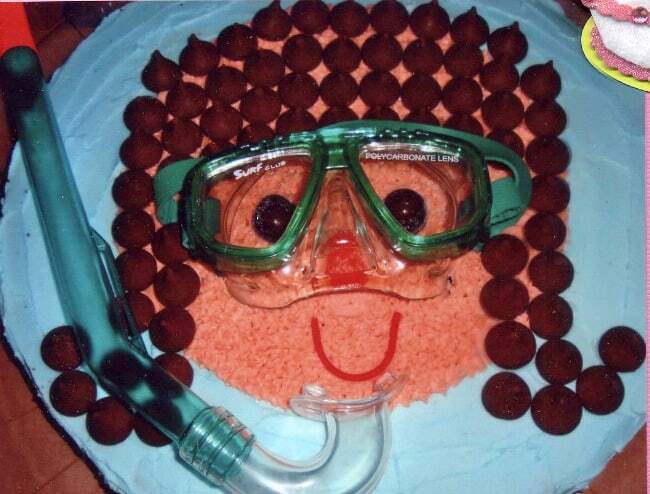 On each face, I positioned a snorkel mask over the eyes and nose, and then laid the snorkel on top of the larger blue cake! The birthday party favors were also very simple- a treat bag full of Swedish fish tied with a ribbon and a little note that thanked each guest for coming to the party! This Party Was So Simple and Easy to Manage! 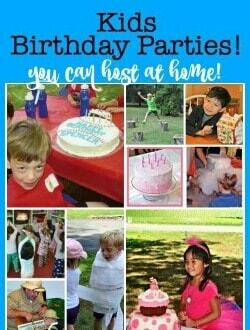 This birthday party was one of the simplest parties I've even thrown! We basically set out the slide and some games and the kids had a blast squealing and going down the slide over and over for the entire party! 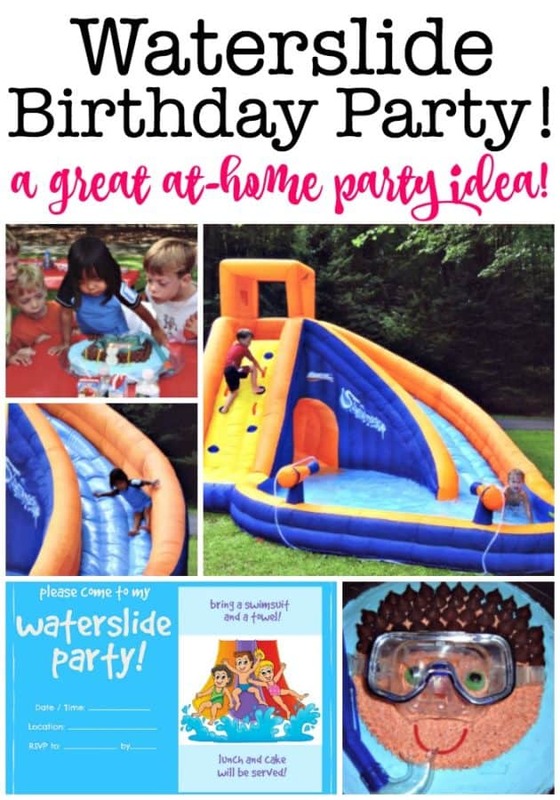 Ready to Download Your Waterslide Birthday Party Printables? Awesome! Simply sign up below to join the MomOf6 community, and you'll be directed to a thank you page with access instructions! The download includes the party invitation and thank you note. 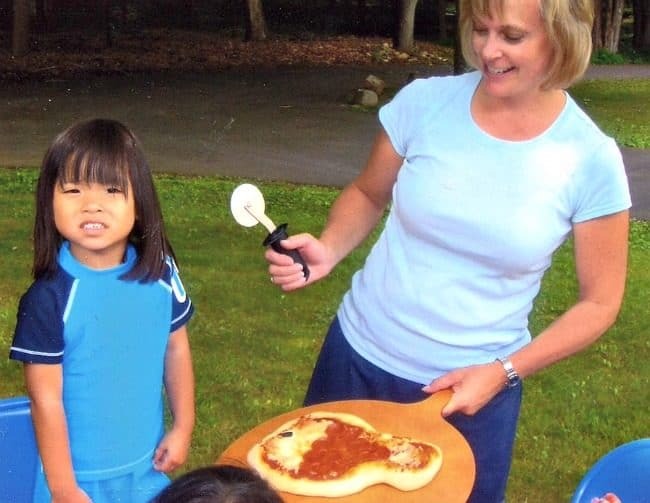 Do you think your kids would love to have a waterside birthday party? « What Moms Really Want for Mother’s Day! oh, 2 separate times, that’s a great idea! my kids are aged 4 & 6 & also want the big waterlide. Their birthdays are only 5 days a part & they have been cool with joint birthdays, but I just might consider this idea.